If you’ve played any sort of free-to-play mobile game with an “RPG” descriptor attached to it, you’ve got a better than even chance of having seen “Gacha/Gasha” or “Gachapon/Gashapon” mechanics in work. I’ve colloquially dubbed these games “RPGacha” in fact. The term gachapon is an onomatopoeia based on the sound made by machines, largely found in Japan (they have entire arcades of them). These machines are sort of like gumball machines, but they dispense little toys and figurines, keychains, stickers, or other sorts of collectible whatsits. The “gacha” is the sound of the crank turning, and the “pon” is the sound of the bubble or egg hitting the door flap, showing its ready to be dispensed. The idea is a little bit like loot boxes, but to me there’s a difference that’s hard to put an exact finger on. At any rate, the gachapon market in Japan is an approximately ¥30 billion (about $270 million) industry, so it’s not terribly surprising that the idea found its way into free to play video games. You use some sort of token to “summon” a creature, which will often have a rarity or ranking factor, with more rare units being more inherently powerful. Often, the less powerful units can be used to “feed” the more powerful units by sacrificing them, typically for exp to level up the more powerful unit or something similar. 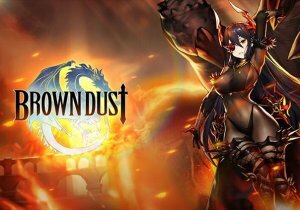 Now that we’ve got that basic explanation out of the way, let me introduce my new favorite RPGacha: Brown Dust. I’ve played a wide variety of these types of games; Puzzle & Dragons, Summoner’s War, Heroes Charge, and the list goes on. As I’ve said, there are a plethora of these RPGacha games out there. Recently, even major intellectual properties have RPGachas, such as Disney Heroes: Battle Mode, Skylanders: Ring of Heroes, and even Looney Tunes: World of Mayhem. With such a pool of games to choose from out there, a title has to have some pretty shining qualities in order to stand above the crowd. Hopefully I can show you why I think Brown Dust does such a sensational job of doing just that. First off, let’s talk about monetization. RPGacha games tend to fall as easily, if not more so, into the trap of pay-to-win as any other free-to-play model. This usually comes in the form of some ultra-powerful unit or creature that is only accessible if you cough up real currency for specialty summoning tokens, or have a certain level of VIP access, or something similar. Brown Dust simply doesn’t work like that. Some of the more powerful units, called legendary units, are difficult to access, or cost a large amount of diamonds, Brown Dust’s cash shop currency, but diamonds can be earned rather readily through game play. In fact, it’s one of the prizes on the daily spin wheel, which you can access, free, up to six times each day. That being said, purchasing diamonds from the store, or one of the variety of starter kits, catch up kits, etc., will give you an advantage in regards to having more diamonds, but there is nothing that can’t be earned through game play. Purchasing diamonds doesn’t even necessarily guarantee you will be able to get a legendary unit, as it’s all random draw. As of yet, I haven’t felt compelled to spend anything on the game. Which is why I probably will choose to do so sometime in the near future. Because I really do enjoy the game. The other part of monetization that a lot of RPGacha games feature is watching ads. Typically for other games, but sometimes for other products as well. “Here you go!” the game promises, “Open this free chest to summon a unit… You just have to watch this 30 second advertisement!” Blech. I’ll do it when I have to, but really, who enjoys them? Brown Dust doesn’t have a single ad anywhere within the app. One of the things I love most about Brown Dust is a combat system that is fairly unique. Before I go down that rabbit hole, which will be extensive, I want to touch on a couple other things first. For example, the story. It’s not high literature or anything, but it is a story that is both engaging, and humorous. There is a good bit of dialogue between the characters that I find myself regularly chuckling at. Another facet that I really enjoy is that the characters in Brown Dust are unique. Many of the RPGacha are either titled after familiar IPs, like the ones I listed earlier, or even just brazenly steal the likenesses and ideas from other popular games. There’s nothing necessarily wrong with either of those, but frankly it’s being done to death. Brown Dust is a refreshing change as far as the originality department, and this is good, because it lends to the storytelling. In fact, many of the characters have a page in their character sheet for their story, and I always check for the page whenever I acquire a new type of unit. A picture is worth 1000 words, so moving pictures about words is worth.. Um.. bout tree-fiddy? Now, I’m not gonna lie, Brown Dust has a lot of fanservice. Like… a whole lot. It’s also got a bit of the “loli” thing going on, which is sort of ‘meh’, but it’s not done in a vulgar way, imo. There is a recurrent theme, though, of almost every female character being in love with the story’s main character. It sort of becomes a running joke. There’s even reasoning behind this, but telling you would spoil the story, and we wouldn’t want to do that, now, would we? Fanservice aside, the art style in the game is absolutely top-notch, as are the graphics. The voices are all in Japanese, though there are English translations to everything. For the most part the translations are all done very well, too. Some games it’s slapped together so haphazardly it makes me cringe. So far all I’ve noticed in Brown Dust is a couple typos (‘Speical’ for ‘Special’ and ‘Lukcy’ for ‘Lucky’ in a couple places). In a small way, the art reminds me of Square Enix’s Bravely Default games, but I couldn’t tell you exactly why. Maybe it’s the big eyes and small noses. It’s definitely a style influenced by anime, though. Whatever land these people are from, it seems it’s very very warm there, always. Alright, now we can get down to the good part: combat. Combat in Brown Dust is done on a battlefield composed of two sides. Each side has a three by six grid of tiles upon which you will place (typically) 9 units. Some missions require less units be used for strategic reasons, and many missions, though not all, allow you to bring a “friend” unit along. Every player can choose one unit as their main. Not only will this show up in their profile image, but it will also be the unit that can be chosen by other people. Having your unit used gives you friend points, which can be used to summon units (including some of the nicer ones). Once you’ve placed your units strategically on the board, you can set a turn order. Now, here’s where things get interesting: The battle begins with the unit designated number one on the right side (this is pretty much always your opponent). Then it proceeds to number one on the right side, then number two on the right, etcetera. After you have begun combat, all of this is automatically played out. Your units will act based on their skill programming until all of the fighting units are defeated. Notice, support units have some special rules as far as this goes, which I will describe later. Some units also have a synergy bonus. This can either be a combo attack, as seen at the end of this clip, or as a boost to stats such as defense or attack. The trick here is the skill programming I mentioned before. I’ll elaborate a bit, but first let me describe the four types of units: defenders, warriors, magicians, and supports. Each of these has some arguable subclasses, like control, ranged DPS, healing, etc, but that would take far longer than I’d be able to hold your attention explaining. Thankfully, the game itself has a very comprehensive game guide that you can explore if you need help with this. Defenders are your standard tanks. Some are more high HP focused, while others are defense or control focused, or some combination of the three. Warriors are your standard damage dealers, though they have a wide variety of skills as well. Magicians are burst damage – they can only attack every second round, but with devastating effect. Finally are the support units. These units are not actually combat units, but instead cast heals, shields, cure debuffs, apply buffs, et cetera. If you have only support units on the field, you will lose the fight. Support units don’t actually count their turn in the rotation cycle. Instead, they give their turn to the next unit in the turn order. IE if my support is turn two, she will take her action and cast her support skill on the unit whose turn order is three. Unit three will then make their attack, unless they’re a magician on an even numbered turn. Each unit attacks in a very specific manner. They have a normal attack, which they will do unless frozen, stunned, or somehow otherwise restricted. They also each have a skill or set of skills attached to their normal attack, as well as an awakened skill which you have to unlock through a special process. The way it works is thus: the ability will target a unit in the same row on the opposing side. It will either attack the front unit of the row, the last unit of the row, or it will skip one unit and attack the second unit in the row. If there’s no opponent in their row, it will go down to the next row, or up to the top row if it’s the bottom row, until something is hit. Careful planning is the key to victory! To additionally complicate matters, the skill can have an area of effect. Some skills, such as those by spear users, attack one or two tiles behind the target. Others attack in a cross pattern, either one or two squares from the center, or an X pattern, like the number five on dice, or sometimes they’ll just lay down the hurt in a three by three square. So one of my favorite Defenders, Britain, attacks with his spear, hitting the first target in the same row as himself. This attack is also capable of hitting the two squares behind his target, if anyone is standing there. Aie, a Magician, uses a three by three square attack that not only hits the last target in a row for considerable damage, but polymorphs them into a monkey if they survive. There are dozens of characters to choose from to form your party of nine on the board, and this is why I love Brown Dust ever so much. The strategies you can apply are myriad. The units also don’t have any elemental affinity, which many many games use in a sort of rock/paper/scissors mechanic. Again, this is just done to death and trite at this point. Instead the units of Brown Dust have things like silences and other “attack disable” type skills. Other units might have immunity to those types of abilities, but might have low base health. Awakening units improves their stats, as well as unlocking their special awakened skill. This isn’t the limit to how you can fine tune your strategy, either. Each unit is able to equip two runes. Runes can increase attack, crit chance, crit damage, defense, or health. Furthermore, some of the runes work on a flat rate, and some a percentage increase. For higher health heroes, for example, you might want to use a percentage perk, but for a low health hero the flat rate could grant far more. Runes get much more complicated, as well, but if you’re still reading it’s a minor miracle, so I’m going to let you figure all that out in game. If all of this strategy stuff sounds too daunting to you, worry not! Remember earlier I mentioned how most units have a story page on their character sheet? Well, all units have a review page. Here, players discuss useful strategies for putting that particular merc to work, which runes work well with them, and why, and how giant the characters boobies are. Because boobies. Each non-PvP level also has a button you can press to find out what strategies people used to get past it. Sometimes they’re useful, sometimes they’re not. Much as I’m loathe to say it, “It’s the internet”, and people can be dweebs. There are a lot of people who really try to help out though on the particularly tough levels. I’m not going to get into the minutiae of each and every aspect of the rest of the content. Suffice to say, each day there’s an aspect of the content that gets a bonus: one day the rune temple, one day mystic island, arena, or novice arena (those three all PVP of some sort, but all entirely optional). There are also unique events for given time periods. I joined during the “Dominus Octo” event, which introduced a set of Legendary units with the same name. You also earn Dominus Octo coins sometimes in battle, and use them to reveal parts of a map. Yet another way to earn diamonds. The hunt for the Dominus Octo is on! At one point, I actually had over 4000 diamonds in game. I simply hadn’t felt the need to spend any, because of how many scrolls the game gives you just for playing. Oh! And I almost forgot, one absolutely great feature is the autoplay function. You know how some games you need a thing, and you have to repeat a level over and over to get the thing, and it’s really grindy and annoying? Well, Brown Dust has some of those things, but it also has an auto-combat feature. You just tell the game how many times to repeat the battle, decide if you want to stop under certain conditions (like a unit having max xp, or if you lose a battle), and then go do something else, like write a review! I give Brown Dust a solid 4.5 out of 5 Gachapons. It’s got a solid story, great graphics, engaging gameplay (that lets you bypass the grind), and one of the best combat systems I’ve seen in an RPG, mobile or otherwise, for quite some time. If the fanservice doesn’t bother you overmuch, and you can overlook a couple oddly glaring typos, then there’s a solid chance that you’d really enjoy this title.